While shopping today, I noticed the Easter and Valentine’s day candies are out already and while poking around I saw the above Altoids tin. It holds 2.29 oz of mints as opposed to the usual 1.75oz in a regular tin. How long have these been out? Have these been out for years and I just never noticed them or are they new this year? I see some places online have them for sale, but the Altoids website makes no mention of them (that I could find). 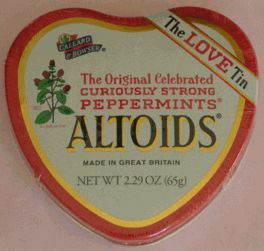 I can recall having seen these tins at least the past couple years around Valentine’s Day. Yeah, I’ve seen them as well. The other tin that I’ve seen is the giant one that they seem to sell for Christmas which then goes on sale and you can buy it dirt cheap and use it to refill your regular tin. … If you like the mint Altoids. I’m rather fond of the Liquorice ones. I’ve bought this one last year….and trying my hardest to find another one but with no luck! If anyone comes across them, let us know what store! RESPONSE: I saw them in Eckerd’s or Walgreen’s….pretty sure it was Eckerd’s. do these have adult things added because the inside says Experi-mint no risk no reward an it says to use it carefully?